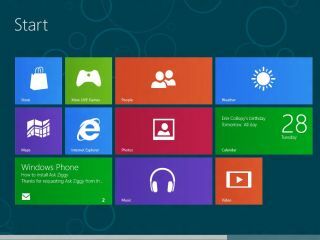 "The complete vision for the product"
Microsoft has unveiled the consumer preview of Windows 8, bringing the next generation operating system a huge step closer to launch. Windows 8 sees Microsoft embrace touch in a way that it has only hinted at in the past, with its Metro user interface borrowing heavily from Windows Phone 7. According to Microsoft, there have been over 100,000 code changes since the Developer Preview, which makes the Consumer Preview a wholly different beast. Taking to TechRadar, director of Windows program management Gabriel Aul said that, although not a finished product, the consumer preview offered "the complete vision for the product". The Windows 8 UK release date is likely to be at the end of the year, with the clever money on October or November. Microsoft is desperate to prove that Windows can remain a force in computing as it moved beyond the traditional domain of laptop and desktop, and Windows 8 represents a bold new vision. The operating system will also be available on ARM products, expanding beyond its traditional domain on x86 Intel and AMD devices. The Windows 8 Consumer Preview download is available from Microsoft now. To get it, head over to http://preview.windows.com.